Long Island Technology Hall of Fame Inducts David Antar, President of A+ Technology & Security Solutions, Inc.
David Antar, Founder and President of A+ Technology & Security Solutions, received the 2016 Entrepreneur Award and was inducted into the Long Island Technology Hall of Fame. He is among a select group of local visionary leaders to have received this award. We love building up the business environment here on Long Island. It's great to be a part of this. 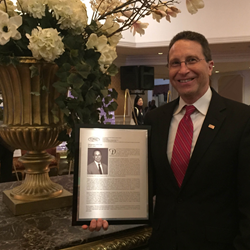 David Antar, President of A+ Technology & Security Solutions, has been inducted into the Long Island Technology Hall of Fame, an honor that recognizes his contributions and exceptional accomplishments as a member of the Long Island science and technology community. As recipient of the Entrepreneur Award, Mr. Antar joins a select group of visionary leaders who have made a major impact on the positive economic climate of Long Island’s technology business sector. The awards dinner and ceremony, held March 2, 2016, at the Garden City hotel, was attended by over 300 professionals representing technology companies and the Long Island businesses with whom they collaborate. Inductees were selected impartially from among nominees submitted by corporate, research and academic institutions, as well as colleagues, peers or personal associates. The LITHF Nomination and Awards Selection Committee then determined the most qualified inductees according to intellectual acumen, lifetime achievement, overall impact on the advancement of science and technology, national prominence, contributions to Long island’s economic devilment and commitment to the Long Island Community. The Long Island Technology Hall of Fame (LITHF), which hosted the awards dinner, provides a mechanism for philanthropy that benefits scholarships, outreach and research initiates that will help to ensure the region continues to thrive as an economic leader in technology-related fields. Historically, this has included significant funding of programs at the College of Engineering and Applied Sciences at Stony Brook University, the Island’s largest source of young engineering and technology talent. A+ Technology & Security Solutions, a regional systems integrator, is a proven leader in the convergence of IT, Audio Visual, LED Lighting, and Security technologies. The company is one of the largest providers of IP Video Surveillance into K-12 and higher education facilities throughout the New York Metropolitan area and is now expanding its services nationwide, with a focus on education, government, healthcare and commercial business markets.